Για εκείνους που θέλουν να απολαύσουν τα αξιοθέατα και τους ήχους της πόλης Τανγκεράνγκ, το Sapphire Sky Hotel BSD City είναι η ιδανική επιλογή. Από εδώ, οι επισκέπτες μπορούν να έχουν άμεση πρόσβαση σε όλα όσα η πόλη έχει να προσφέρει. Με την βολική του τοποθεσία, το ξενοδοχείο προσφέρει εύκολη πρόσβαση στους προορισμούς της πόλης που πρέπει οπωσδήποτε να δείτε. Με τις υψηλού επιπέδου υπηρεσίες και την μεγάλη ποικιλία ανέσεων, το Sapphire Sky Hotel BSD City δεσμεύεται ότι η διαμονή σας θα είναι όσο πιο άνετη γίνεται. Για να ονομάσουμε μόνο λίγες από τις εγκαταστάσεις του ξενοδοχείου, υπάρχουν τα 24ωρη υπηρεσία δωματίου, δωρεάν WiFi σε όλα τα δωμάτια, 24ωρη φύλαξη, ημερήσιος καθαρισμός, υπηρεσία ταξί. Η ατμόσφαιρα του Sapphire Sky Hotel BSD City αντανακλάται σε κάθε δωμάτιο. Στην ιδιοκτησία θα βρείτε επίπεδη τηλεόραση, σύνδεση internet (ασύρματη), δωμάτια για μη καπνίζοντες, κλιματισμός, υπηρεσία αφύπνισης, καθώς και πολλά άλλα. Η πλήρης λίστα των ψυχαγωγικών υπηρεσιών είναι διαθέσιμη στο ξενοδοχείο, συμπεριλαμβανομένων των εξωτερική πισίνα. 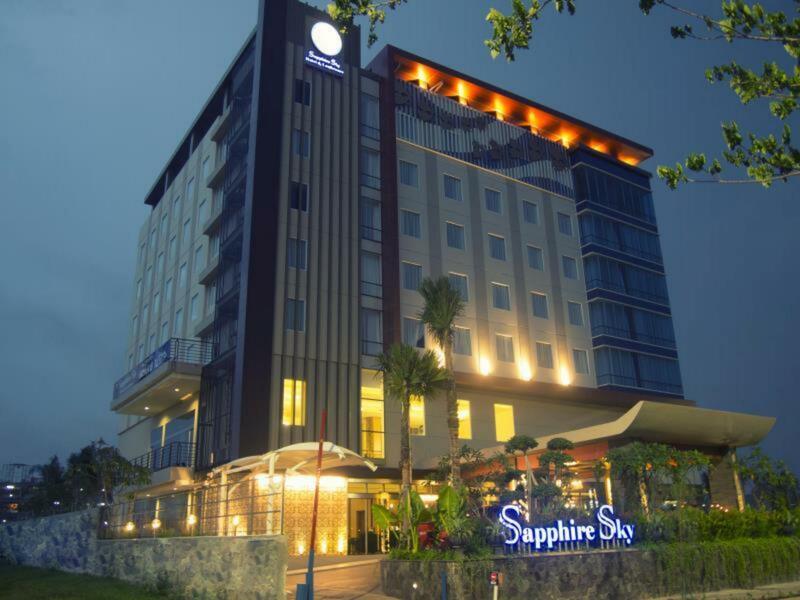 Το Sapphire Sky Hotel BSD City είναι ένας ιδανικός τόπος για να μείνετε αν ψάχνετε για γοητεία, άνεση και ευκολία στη Τανγκεράνγκ. Great place to stay if you have conference to attend around Serpong, located not too far from the main road (pahlawan seribu) and quite near to ICE BSD. Worth to notice, there is no public transpo going to/from the hotel. Therefore the hotel provides shuttles going around tourist spots around Serpong. Yu can also use online taxi or bring your own car. The room is clean. We had a problem in the morning. The cigarette's smoke went into our toilet's ventilation (I supposed), I informed the front office and after a while I do not smell the unpleasant odor anymore. The buffet is great (considering the room rate), to be honest I was surprised with the variety of food and drinks. The taste is not bad at all. The bubur ayam (chicken porridge) is very recommended. They have a very big space next to the hotel for parking, you do not need to worry when you're driving and going to the hotel late at night. The space is also monitored with CCTV. We will definitely go back again! I was booked via agoda. And agoda sent the email booking confirmation. The room is include breakfast. But the staff said room only when i will take a breakfast in the morning. Thank you so much for this condition. And i never trust anymore with agoda and saphhire hotel. Very good hotel, small but very nice, the breakfast was so nice and we can sleep well after we went to the all of BSD icon, all of tired will be recover in this room. For fee is cheap and good for staycation and holiday. Thank you for the good services. I choose this hotel because the location nearby the event I attended. No restaurant and convenient store within walking distance. The reception staff need to be more friendly with guest. The room is not sound proof, you could hear noise from outside next room. The room is dirty, the bed sheet also not clean, the breakfast is standard. Limited parking area, they help you with valet parking. All was good except for the parking space and swimming pool. When the parking space is full, they have valet service but I did not use it, instead they lead us to an open space next to the hotel where they did not maintain it (high grass, no lights only the road lights). No wonder they offered valet. The swimming pool was small and depth of abt 1.20m min. No pool for kids so not convenient if we want our kids to play water on their own. The hotel is still new. Breakfast is delicous. They have free shuttle to aeon mall. The room is nice and comfortable. The bed is comfort too. Wifi is not really good inside the room. You must go to room aisle if you want get nice wifi signal. I booked 2 rooms, came with my parents. My dad accidentaly broke a saucer in his room and was told to pay 400.000+ rupiah to replace the whole set. I was so upset with the management about this. After talking for hours with the reception team, we came to a solution with a very helpful manager, pak ibnu. And happy with the solution. He’s a superstar! The top management could have been better not pushing the staff with this sort of thing. I wasnt gonna complain with the leaking aircon, dirty bed sheet,there even a hole in it! Now i just have to say everything to be fair. The housekeeping staff was very nice about it and change the bed sheet straight away for me. Other than that i was supposedly happy with the stay. Months ago I stayed here and was satisfied with this hotel so now when I travel to BSD I choose this hotel. This time a bit dissapointed because: 1. Some of the lights in the bedroom are broken, I still can tolerate. 2. I cannot have buffet breakfast because the occupancy is low so the breakfast will be delivered to my room. OK then... But they limited my breakfast. Well... I payed for full price for the room. 3. The communication among staffs are not good. The reception said I will have buffet breakfast for the next day or I will be called. There was no call at all. I called the room service, they said they will deliver limited breakfast to my room (AGAIN). The hotel offers basic amenities, good and standard bed. Location-wise it wasn't good for food searching etc, but we can always use the Go-food/Grab food online services for food. No taxi standby, so we really need to rely on online taxis- which is no problem at all. It has pool, small one, but mostly full on weekend. Quite a nice hotel but during my stay, the staff keep reminding me through phone and even slipped a letter under my door that I cannot extend my stay due to a fully booked room. I mean, yes, I understand. And I stated it clearly when I first asked the front office. The way they keep reminding me through the phone (at 7 am after I had a long working night, no less xD) was quite rude. 1. The hotel staff remove one of our 3 luggages from our room suspecting we have more than 2 people staying in the room. 2. They have no right to remove our luggage from the room without our consent, that is equal to stealing. Indeed, there was not even a note to notify us. 3. If they suspect we have more than 2 people staying in the room, they could verify with our present. 4. There is a rule to limit number of people staying in a room, but there is no rule limiting number of luggage per customer! 5. one of the night, the corridor still turn on music at 2am - 3am. I called front desk at least 2 times but no one answer the call! Very nice staff, although only 1 or 2 knows English. but they are generally very courteous. I ask for more toilet paper, water and they happily accomodate. Very value for money for the price it is only like 10 minute away from ICE. Taxi to ICE cost only at most USD3. So, it is a good place if you have events at ICE. Not too far to the nearest shopping centre. Keep in mind the grab or go car service in Indonesia is very cheap. Over all oke..varian of food must being improved but for taste is well done. Lacking the essential small torches like a soap to wash hands, facial tissues, hair conditioner and body lotion. The reception is wrongly located and the area is too small especially when a group check in taking place.